Crash Forensics provides tire failure analysis services for passenger vehicles, heavy trucks, and heavy equipment tires. We analyze both tire failures that cause vehicle crashes as well as failures that occur during tire handling and service. 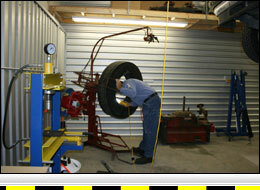 Failure analysis services can be conducted "on site" from our mobile lab or "in house" in our automotive lab. Below is a discussion of tire failures. Link to our automotive expert. Tread detachments are the most common tire failures that cause loss-of-control crash. Tread detachment may or may not result in rapid deflation of a tire. Since tread detachment throws the failed tire out of balance and applies a lateral force to the vehicle, rapid deflation of the tire is not required to cause a loss of control of the vehicle. Possible causes of tread detachments include fatigue failures such as under-inflation/overloading, excessive speed, unrepaired injuries, repair defects, impacts, mounting damage, tire age, and internal rusting. Fatigue failures are most typically caused by the over-deflection of the tire as a result of under-inflation and/or overloading. 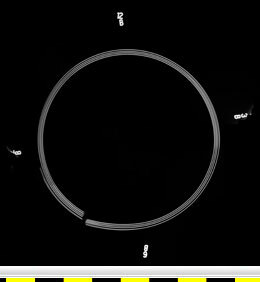 Over-deflection will produce evidence on the tire such as darkening of the inside wall of the tire, wrinkling of the inside wall of the tire, and heavy abrasions on both the inside and the outside wall of the tire. Fatigue failures can also result from other conditions such as severe steering or axle misalignment. Alignment conditions can cause a tire to scuff under normal operation. Constant and severe scuffing of a tire will generate heat and will fatigue the tire. If scuffing caused by misalignment exists, it will be evidenced by irregular wear patterns on the tire tread. Impacts to the tread surface of the tire can weaken or break the tire's structure. Impacts are characterized as a "severe, concentrated impact with a foreign object, curb or pothole". Sources also report that "total tire failure could be immediate or delayed depending upon the severity of the impact." Impacts to the tread area of the tire create a break across the tire crown with corresponding perpendicular breaks in the tire sidewall. 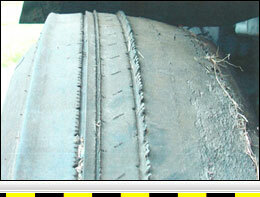 Tire aging is a commonly cited cause of tread separations. Tires, like any other rubber product, have a limited service life. Mercedes-Benz says "Tires undergo an aging process even when they are not in use... The rubber parts become less elastic, the steel webbing inside the tire corrodes and the rubber mixture of which the tread is formed hardens." Long existing standards warn of the hazards of using old tires and indicate that a tire that is six years old or more needs to be inspected. More recent standards require that tires six years old or more not be installed on a vehicle and that tires ten years old should be taken out of service. Internal rusting is a well-known cause of tire failure. Rusting of the steel cables in the tire occurs as a result of injuries and age cracks that expose the steel to contaminants such as water and road deicers. For this reason, tire repair standards require that a repair not only seal an injury to prevent inflation air from escaping the tire but also seal the injury to prevent contaminants from entering the tire casing. Rusting of a tire's steel cables weakens the steel and weakens the bonding of the steel to the rubber. 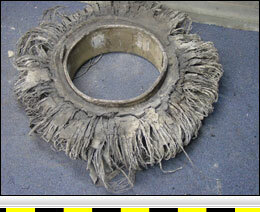 A tire weakened from rust will ultimately fail by tread separation. Retread failures are misunderstood. The common perception is that retreads have adhesion-related problems that result in the loss of tread from the tire casing. In reality, this type of adhesion failure is very uncommon. 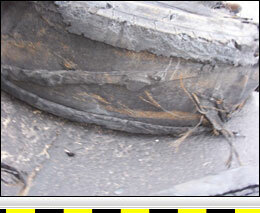 Adhesion failures in a retread tire are generally localized and result in the tire tread coming off in small pieces. When these pieces of the pre-cure retread separate from the tire, no steel will be contained in the separated rubber. The real concern with retreads is not related to the adhesion of the new tread to the tire casing, but rather to the condition of the casing. Casing defects such as the ones previously discussed are often overlooked during retreading. Therefore, the reliability of retreads relates primarily to the ability to inspect the tire casing and determine if defects exist in the casing. Tire defects can be hidden underneath the components of the tire and thereby extremely difficult to discover during a retread inspection. The use of retreaded tires on a truck steer axle is widely discouraged in the trucking industry. Although laws prohibiting the use of retreads on steer axle tires only apply to school buses, it is difficult to find anyone in the trucking industry with experience using retreads that is willing to place them on the steer axle of their trucks. The tire retread industry accepts the use of retreads on steer axles if specific guidelines are met and a tire is certified for use on a steer axle by the retreader. According to a retread industry association, TIA (Tire Industry Association), the retread identification code should contain an F1 after the date code to indicate that a retread tire has been certified for use on a steer axle. The standards for certification of a retreaded tire for use on a steer axle are conditional and exclude the use of tires with certain identifiable casing defects. Additionally, these standards only promote the use of retreads in short-haul, low-speed, high-wear/short-tread-life operations. Service failures that occur during the mounting, inflating, and handling of tires and wheels commonly cause catastrophic and fatal injuries to tire mechanics. Inflated tires contain a large amount of potential energy and a rapid release of that energy can injure anyone in the trajectory of the escaping air and objects propelled by the escaping air. All tires pose some risk, but the larger higher-pressured tires are more dangerous than smaller lower-pressured tires. As a result OSHA regulates servicing of tires and wheels used on "large vehicles such as trucks, tractors, trailers, buses and off-road machines" through CFR 29 §1910.177. This regulation has specific guidelines for handling tires and also requires that anyone handling large tires receive tire service training.